seiryoo, seiryuu 青龍; 青竜 "blue dragon", "green dragon"
The Azure Dragon is one of the Four Symbols of the Chinese constellations. It represents the east and the spring season. It should not be confused with the mythological yellow dragon that is associated with the Emperor of China. It is also referred to in media, feng shui, other cultures, etc., as the Green Dragon and the Avalon Dragon. It is known as Qinglong in Chinese, Seiryuu in Japanese, Cheongnyong in Korean, and Thanh Long in Vietnamese. It is sometimes called the Azure Dragon of the East (simplified Chinese: 东方青龙; traditional Chinese: 東方青龍; pinyin: Dōng Fāng Qīng Lóng, or sometimes simplified Chinese: 东方苍龙; traditional Chinese: 東方蒼龍; pinyin: Dōng Fāng Cāng Lóng). In the novel Shuo Tang Yanyi (Tales of Tang Dynasty), the White Tiger's star is reincarnated as General Luo Cheng (羅成 / 罗成), who served Li Shimin. The Azure Dragon's Star is reincarnated as General Shan Xiongxin (單雄信 / 单雄信), who served Wang Shichong. The two generals are sworn brothers of Qin Shubao (秦叔寶 / 秦叔宝), Cheng Zhijie (程知節 / 程知节) & Yuchi Jingde (尉遲敬德 / 尉迟敬德). After death, their souls are said to possess heroes of the Tang & Liao dynasties, such as Xue Rengui (薛仁貴 / 薛仁贵) & He Suwen (郃苏文). In other legends, the Tang Dynasty general Xue Rengui is said to be the reincarnation of the White Tiger's Star. While his archenemy, General He Suwen of the Liao Dynasty is said to be the reincarnation of the Azure Dragon's Star. and the center is protected by the Yellow Dragon. In Kyoto there are temples dedicated to each of these guardian spirits. The Azure Dragon is represented in the Kiyomizu Temple in eastern Kyoto. Before the entrance of the temple there is a statue of the dragon which is said to drink from the waterfall within the temple complex at nighttime. Therefore each year a ceremony is held to worship the dragon of the east. In 1983, the Kitora Tomb was found in the village of Asuka. All four guardians were painted on the walls (in the corresponding directions) and a system of the constellations was painted on the ceiling. This is one of the few ancient records of the four guardians. In Korea, the murals of the Goguryeo Tombs found at Uhyon-ni in South Pyongan province features the Azure Dragon and the other mythological creatures of the four symbols. It was in 805 that Kūkai finally met Master Hui-kuo (746 – 805) the man who would initiate him into the esoteric Buddhism tradition at Changan's Qinglong Monastery (青龍寺). Huiguo came from an illustrious lineage of Buddhist masters, famed especially for translating Sanskrit texts into Chinese, including the Mahavairocana Sutra.
. The Four Directions 東西南北 . .
Hiragawa was seen as the Green Dragon in the East. This name refers to the Chinese legends. Green Dragon Temple is a famous Buddhist Temple from the Tang Dynasty (618-907). When it was built in 582, it was called Linggan Temple (Temple of Inspiration) and then renamed to its present one in 711. When Buddhism was prevalent during the Tang Dynasty, some Japanese monks were sent to China to study Buddhism. Six of them studied at Green Dragon Temple, and this led to a flourishing period of the temple in the ninth century. Kukai, the most learned of the six monks, made great progress in learning Buddhist sutras, Sanskrit, poems and Chinese calligraphy. After his return to Japan in 806, he advocated the building of a Vagra Temple (Vagra means Buddhist Warrior Attendant) and founded the Zhenyan Sect (the True Word Sect). He is highly honored by both Japanese and Chinese, and in 1982 Kukai Monument was constructed inside the Green Dragon Temple. For uncertain reasons the Green Dragon Temple which had no fortune, like other ancient temples was destroyed. This was perhaps during the Northern Song Dynasty (960-1127). The present temple was reconstructed in 1963. Memorial halls for the earlier monks and exhibition halls with some excavations displayed are all built in the Tang architectural style. 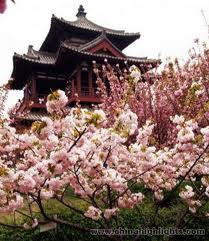 Green Dragon Temple is a place where the cherry blossoms can be enjoyed. Every year during May and June, an endless stream, of tourists comes to appreciate its beauty. There are a few temples of this name in Japan. is a Kōyasan Betsuin (an affiliate temple) located in Aomori, Aomori Prefecture. The temple was founded by a Great Acharya Ryūkou Oda (織田隆弘), who later built Shōwa Daibutsu (昭和大仏) in 1984. 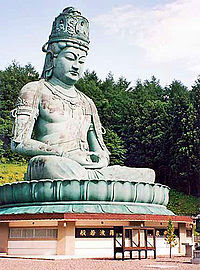 Roughly 21.35 meters in height, it is the tallest seated bronze figure of Buddha in Japan.
. Temple 36 Shooryuuji 青龍寺 . Seiryuji 青龍寺 on the Rakuyo Pilgrimage in Higashiyama, of Kyoto.
. Shrines named Seiryu Jinja 青龍神社 . A blue dragon from the mural of an ancient tomb located in Nara Prefecture in western Japan has been shown to the media. The Kitora tomb in Asuka Village is believed to have been built sometime between the late 7th and early 8th centuries. Workers finished restoring murals from a stone chamber inside the tomb in December after more than a decade of work. The murals are now preserved at a nearby museum. 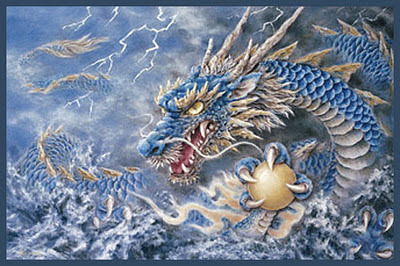 The Azure Dragon is one of 4 mythological guardian deities for points of the compass that are depicted on the 4 walls. The blue dragon was found in poor condition with mud covering much of the painting. During the restoration, mold and other damage was removed to prevent further deterioration. Most of the dragon still cannot be seen. A long red tongue protruding from the creature's mouth is barely visible.